Start by bringing a medium pot of water to a boil. Add 1 T of white vinegar and 1 t of salt. 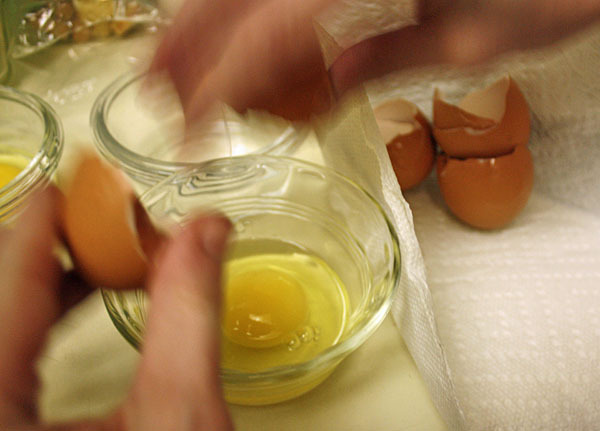 Reduce to a simmer and reserve for poaching the eggs. 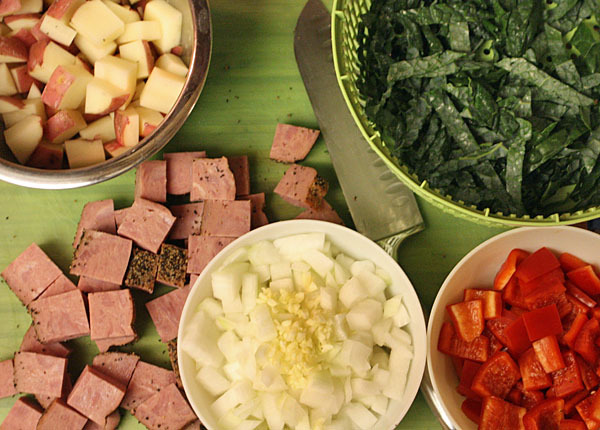 While the water’s coming to temp, knock out the prep: Stem and slice 3 large leaves of black, lacinto or dino kale; seed and medium dice 1 red bell pepper; small dice 1/2 yellow onion; mince 1 clove of garlic; and medium dice 1 red potato. In a large saute pan heat 1/2 T of olive oil over medium-high heat. 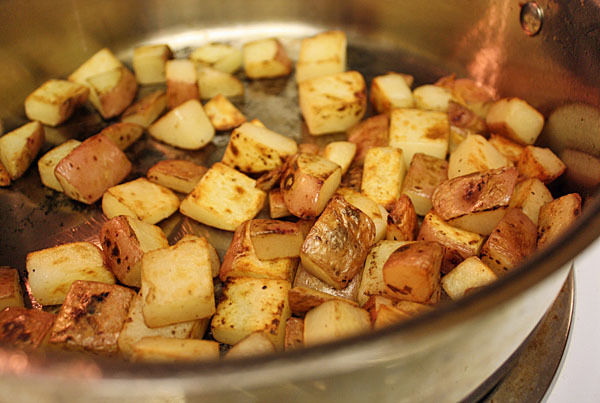 Add the potatoes and cook over medium-high heat for 1-2 minutes, then reduce heat to medium-low. Cook until potatoes are tender on the inside but crispy on the outside, about 10 minutes. Remove the potatoes from the pan and reserve. In the same saute pan, over a medium-high heat, add the remaining 1/2 T of olive oil. Add 8 oz. 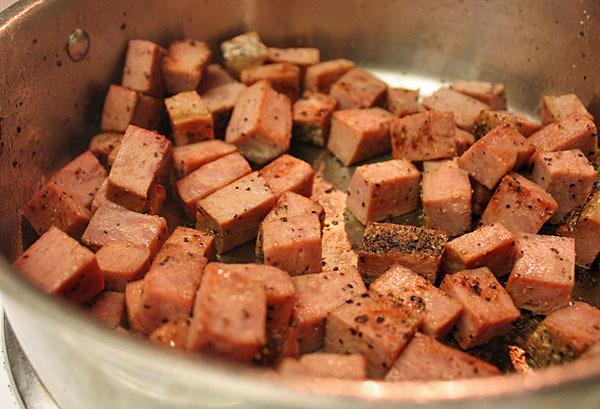 of turkey pastrami and cook, stirring occasionally for 3-4 minutes until the meat turns golden brown on the outside. Add the bell pepper, onion and garlic, and cook, stirring occasionally, for 2-3 minutes until the vegetables soften. 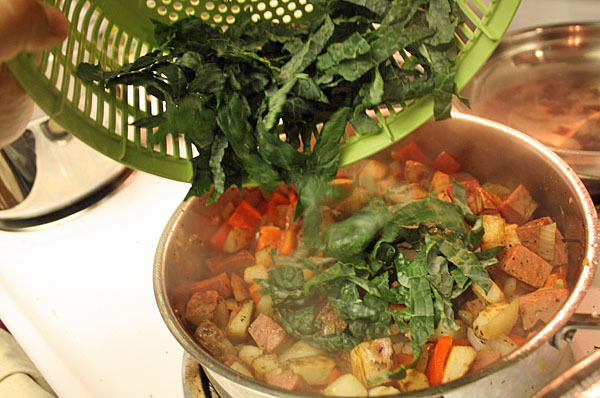 To finish the hash, add the potatoes and kale to the pan and cook until the kale has softened, about 4 minutes. 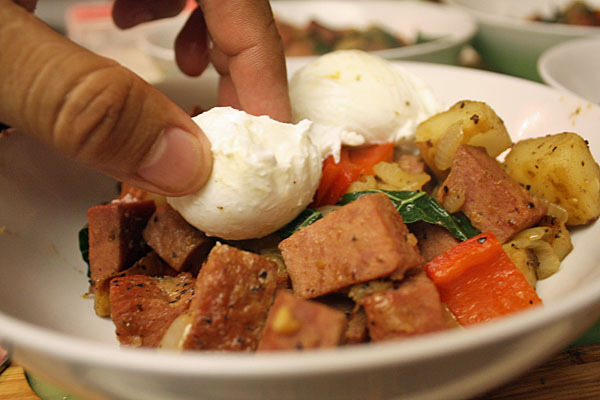 While you’re finishing off the hash, you can begin to poach 4 eggs. Drop ’em in the boiling water for 3 minutes 30 seconds-3 minutes 45 seconds, until whites look set, but before the yolks have hardened. To plate: Put 1/2 of the hash on each plate. 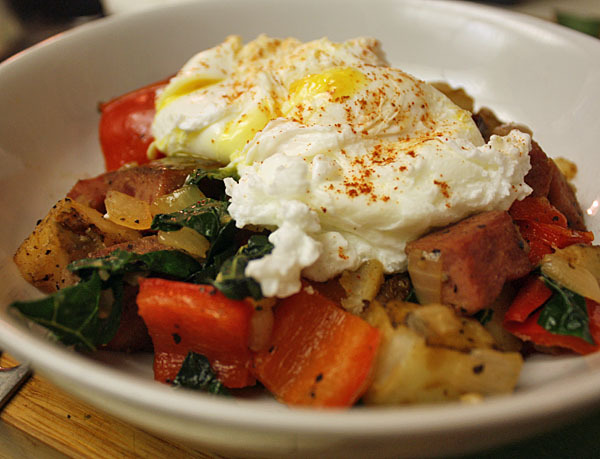 Top each with two poached eggs, then hit the eggs with a dash of smoked paprika to finish it off. You’d expect pan fried potatoes to be oily, but Chef Brian keeps everything light with only 1 tablespoon of oil in the entire dish. That’s possible because of the turkey pastrami, which provides extra oil for flavoring and softening the veggies. And even though his final instructions for the hash were to salt and pepper to taste, I’d suggest holding off on that and trying it without first because the meat carries salt and pepper on its own. The fresh veggies cut through the richness of the pastrami and egg yolk, while the smallish portion of crispy potatoes still manage to satisfy as great breakfast potatoes should.